Music started for Samantha Fish as a teenager, when she picked up drums and guitar and frequented a local venue, Knuckleheads Saloon. Located in her hometown of Kansas City, Miss., Knuckleheads is a historic rock & roll venue, having witnessed the likes of Elvis Presley, Jimi Hendrix and Buddy Holly on its stage. Inspired by those classic rock and blues heroes, Fish set out on her journey to break into music by releasing her debut album, Live Bait, subsequently signing to the venerable Ruf Records. With nearly 10 albums and countless collaborations with the likes of Devon Allman and Buddy Guy (whom she once shared the stage with), Fish has cemented her presence in contemporary blues. Her most recent album, Belle of the West, released in November 2017, is a testament to the incredible growth Fish has gone through in her career. Sporting a rustic blend of Delta blues, thunderous guitars and raucous vocals, she pays homage to the rich musical history of the south. “I wanted to do this acoustic-electric record, and tap into the style and swagger of Mississippi,” she said in an interview on her website. Sure enough, with the driving panache of “No Angels,” the powerful narrative of “Cowtown” and other memorable cuts, Belle of the West is an incredible distillation of Americana. The lyricism, as with much of her musical output, is rootsy and emotional, describing tales of love, loss and an ever-changing life on the road. Her deft guitar skills, ranging from fingerpicked blues to wailing solos, are widely recognized as some of the best in the business; in a video interview with Reverb.com in 2017, Fish gave audiences an intimate look at her unique skills and guitar rig. Perseverance as a female in a largely-male dominated industry is often brought up in the context of Samantha Fish, such as an interview with AXS last month, but her attitude has always been one of resilience. “When you are young, you are female, and you are being told what to do, it can be hard to know what your own compass is,” she said in the interview. “(But) I don’t let that bother me. I have the confidence to say what (I) want. I don’t worry too much about it.” With a flurry of accolades like one of Best New Albums of 2017 from The New York Times’ pop critic, Joe Caramanica, for 2017’s soul-inflected Chills & Fever, number one spots on the Billboard Blues charts for two albums and more, Fish is busy paving the path ahead for young, starry-eyed blues rockers everywhere, female or otherwise. 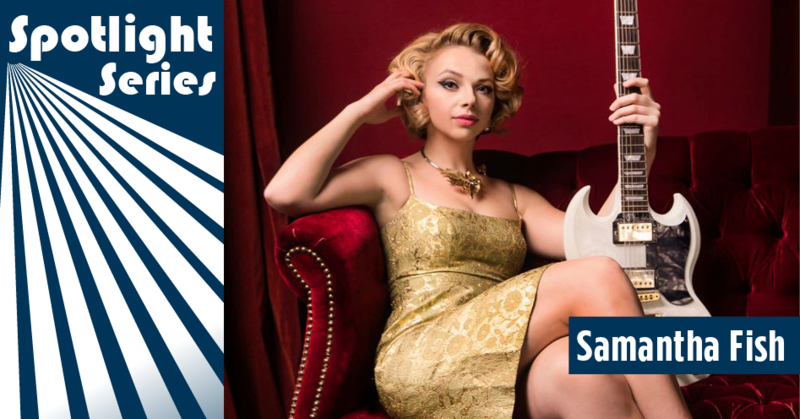 Make sure you RSVP to experience the uplifting, bluesy power of Samantha Fish at Levitt AMP Stevens Point tonight––as well as Levitt AMP Galva this Sunday and Levitt AMP Middlesboro on August 16!